The WalSlide slides and locks to any position along its 6' system. 10-5095 - Overhead section with sliding band/tubing anchor is height adjustable. The two foot horizontal overhead section comes with locking band and tubing anchor that slides along center channel of overhead section. Anchor can be locked in place at optimal distance away from wall. 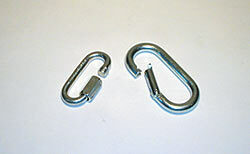 Pulley system, band or tubing (not included) can be attached to anchor to perform exercises. Adjustable overhead section comes with sliding attachment mechanism to lock the overhead section in place at ANY height along vertical Original WalSlide section. Band, tubing and handles are sold separately. To use exercise station, band or tubing is secured to locking anchor at desired height. CanDo WalSlide original exercise station complete is easy to assemble, simple to use, and takes up little space. Locking anchor on center channel allows for unlimited height positions. Heavy-duty aluminum frame is perfect for the professional setting. The exercise station has a very limited wall footprint and includes height adjustable overhead section. The two foot horizontal overhead section comes with locking band and tubing anchor that slides along center channel of overhead section. Anchor can be locked in place at optimal distance away from wall. 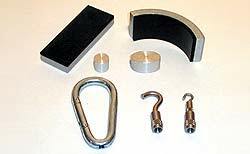 Pulley system, band or tubing (not included) can be attached to anchor to perform exercises. Adjustable overhead section comes with sliding attachment mechanism to lock the overhead section in place at ANY height along vertical Original WalSlide section. Band, tubing and handles are sold separately. 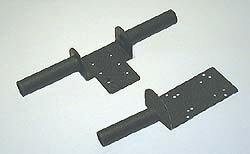 To use exercise station, band or tubing is secured to locking anchor at desired height. Pulley system with ropes and handles not included. 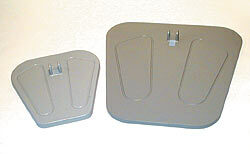 Attach push pull dynamometers to base for job task analysis and back-leg-chest evaluations. To perform these evaluations, use a push pull dynamometer, a base, chain, and an oval. 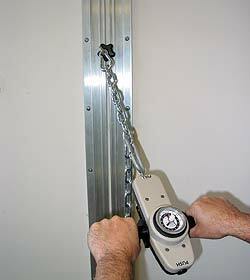 5 feet of chain is most commonly used, as well as the snap oval and regular base.